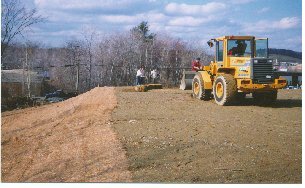 Erosion Control and Construction Monitoring | Seekamp Environmental Consulting, Inc.
Seekamp Environmental Consulting, Inc. (SEC) was contacted requesting assistance controlling severe erosion and sedimentation on a parcel of land in a North Andover industrial park. 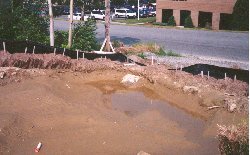 The 4-acre lot had been entirely stripped of vegetation and topsoil in anticipation of construction of a large commercial building. During fall rains, the unprotected slopes began to erode; and sediment flowed into the street drainage system, which in turn, discharged into wetlands a quarter mile from the site. The North Andover Conservation Commission and the Planning Board requested immediate site control and cleanup. SEC was hired to coordinate and oversee corrective measures, including detention pond excavation, silt fence and hay bale installation, and check dam construction. SEC recognized that the measures were temporary until weather permitted planting vegetative cover or building construction: the two possible long-term solutions. SEC then designed a long-term soil stabilization plan including loaming and seeding specifications. The plan was approved by the Town boards. The work completed in early August. By October, the site was completely re-vegetated by a thick mix of grasses and legumes. The Town lifted enforcement orders, and all activities at the site were finished.